Where I live in the Pacific Northwest, summers are generally not hot in the traditional way. We get sunshine and warm days in July and August in particular, but I wouldn't call them scorchers. This week - out of the blue - we're having what could be described as more traditional hot weather with the sun beating down. I was out riding transit, walking on concrete sidewalks and climbing broken up-escalators yesterday and came home sweating buckets. I almost immediately had to start cooking the hot meal I had planned. That was the moment I realized I needed to pull out a few cool salads to take us through the next few days. 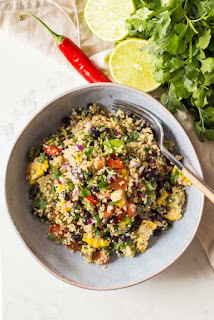 I have a lot of quinoa in my pantry now, so first on my list is this vegetarian salad with a Mexican flavour. I saw the how-to video on Facebook, so headed over to their website - Green Healthy Cooking - to snag the recipe. Anything make-ahead works for me and in this rare hot streak, one that is marinated and comes right out of the refrigerator at dinner time is a blessing. Add a few rolls and I'm done. However, my husband and the one son I have left at home are serious meat-eaters so I may offer some cooked chicken on the side they can add in. One note - I've made marinated salad recipes with avocado before and honestly like them best when they've had a bit of time to marinate. The avocado softens and a bit of it becomes part of the dressing, making the salad creamier. So I suggest making this in the morning so it has all day for the flavours to blend. And if you're lucky - you'll have enough left over for lunch the next day! As the original site shares, this could be a side salad as well, but for me it's going to be a full meal deal. If fact I'm making it tonight, but will be serving it tomorrow night as we have a dinner date with friends tonight. Makes tomorrow a breeze. Place quinoa and stock into a pot and bring to the boil. Once boiling reduce heat immediately to low and cover tightly with lid. Cook for approx. 15 minutes or until done. While it is cooking wash and prepare all the vegetables. Once quinoa is cooked, fluff with a fork. Add to bowl with all other ingredients. Season with salt, pepper and a lot of lime juice. Stir and serve.